Your happily ever after starts in El Gouna! You have decided to say your vows and marry your significant other and want to plan an unforgettable wedding. Look no further, as El Gouna hotels, located by the Red Sea have a variety of options that can transform your special day to an extraordinary one that will leave everyone talking about it for months to come. 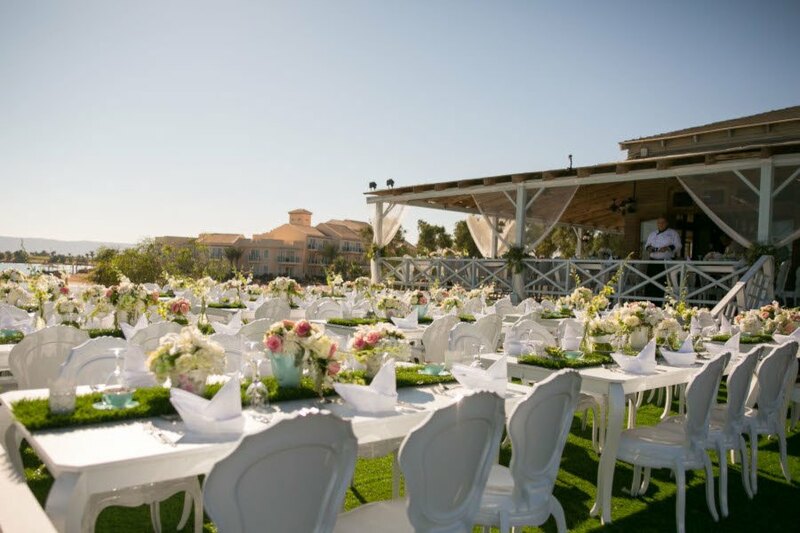 Not only that, El Gouna is host to one of the most loved wedding planning boutiques, Decarma MF , run by Marley Feckry, a Certified Destination Wedding Planner, who has brought some of El Gouna’s most illustrious event and destination weddings to life in the El Gouna hotels. Weddings in El Gouna have grown in number, starting from 20 weddings per year to approximately 45, as El Gouna’s remarkable location by the Red Sea, and only 40 minutes away from Hurghada International Airport makes it an ideal location for Egyptian and international couples, alike. The distinguished design of interlinked lagoons, crossed by idyllic bridges, and the vast green golf courses all embraced by a stunning mountain chain make every corner instagrammable‑ pulling in brides and grooms to be from Egypt and from all over the world, looking for a destination wedding that would take them and their guests on the adventure of a lifetime. Fancy a fairytale wedding? Perhaps a private one with close friends would suit you? Prefer relaxed to glamourous? Whatever the choice, all the El Gouna hotels have been well-prepared to host a variety of themed weddings; accommodating all sizes and unique tastes. The wide selection of El Gouna hotels, each with their own special location and facilities, allows you to arrange every detail to ensure that it matches what you are looking for. This spacious hotel is the perfect location for classic and romantic weddings. Located on the beach, lovers can have their photo session taken on the several small bridges that connect the 9 private islands that make up this remarkable hotel. Whether you invite an intimate number of guests or a large crowd, the hotel has enough rooms to accommodate them all, and transporting them from their rooms to the wedding venue using golf-carts specially reserved for your wedding. Children and loved ones will be able to benefit from the hotel’s various swimming pools and catch up on their tans to look their best on your special day. Prepare to be enchanted at La Maison Bleue, this distinguished boutique hotel has astonished the hundreds of celebrity guests who have visited this novel architectural feat, whether it was for a wedding, an event, or to spend a luxurious day by the pool or beach, or in the spa. With the French designed architecture, exclusive amenities in each room in the hotel, and private location, far from the maddening crown of the marina, this quiet hotel will take you, and your guests’, breath away. Where no corner fails to impress, La Maison Bleue is suited for couples who would like to host a destination wedding that transports them to a time of elegance and glamour. With the flexibility of hosting both small and large weddings, La Maison Bleue’s pool patio, architecture and sea view will make any wedding awe-inspiring. The Spanish-Moroccan design of this large hotel has inspired many couples to host some of El Gouna’s most glamorous and lavish weddings. With a variety of venues on the Ancient Sand’s premises, couples are spoiled for choice as they can have their event on the pool patio, the green yard or the golf course gardens. Not only that, the hotel is flexible enough to accommodate many themes, from the simple to the simply extravagant, extending their services to the hotels’ customized cuisine to find a menu that suits your taste and budget. Start your wedding in the afternoon and enjoy the gentle breeze swirling through intricately designed floral arrangements. Capture your wedding photos as the sun sets behind the nearby mountains while you get ready to party throughout the evening and welcome your guests to the banquet that will impress them in the nigh-time. Bare-foot brides and grooms, this hotel is for you. Situated right on the beach, the Movenpick Resort and Spa brings the best in hospitality to host your wedding on its pristine sandy beaches. Whether you wish to have an elegant affair or a rustic themed wedding, the hotel’s variety of locations, on the beach or in the El-Sayadeen Restaurant, will capture your eyes and heart as the mesmerizing sea view will provide the perfect backdrop to your special day. Want to provide your guests with an unforgettable experience? The Movenpick Resort and Spa has a large number or rooms that can host all your guests so that they can make more memories with you and with their loved ones on the shores of the Red Sea. Looking for a scenic wedding without the hassle of too many guests? Then the Steigenberger Golf Resort is one of your best options. Overlooking one of El Gouna calm lagoons, this El Gouna hotel will provide you with the privacy that you seek with your dearest and closest. Make use of the large outdoor pool area and allow the hotel to cater to your culinary tastes by providing you with some of the most delectable menu options available in El Gouna hotels. Organise your photoshoots by the pool as you as the breeze sashays the palm trees, or have portrait taken with the sunset and cotton candy skies as your backdrop. Lights, cameras, buttery beaches, and palm trees? For brides and grooms who really want a wedding to stun their guests, The Smokery Beach and Restaurant is ideal for you. Kick off your shoes as you walk down the aisle. Wear your sunglasses as you dance the day and night away at this exclusively located beach restaurant. A favourite of celebrity guests during the El Gouna Film Festival, this venue is easy to reach on the El Gouna marina and is walking distance from several hotels nearby, such as Mosaique, Captain’s Inn and Turtles’ Inn, if your guests choose to stay there. A seafood lover? Indulge your palate in Egypt’s most exclusive sushi and salmon menu that will put a contemporary twist on their seafood menu to suit your tastes. Too cool for glamourous weddings? Feed your boho side by hosting your wedding in El Gouna’s heart, The Clubhouse. A favourite of the hip crowd in Egypt, this unique venue has a private pool, lagoon front and variety of activities to keep your guests, young and old, entertained from morning until night. Easy to reach and well-known by all, The Clubhouse in Downtown El Gouna will provide you with several decorative opportunities and suggestions to make sure that your event is one that is designed to your taste. This exclusive and intimate location is a hidden treasure for weddings. Located close to Downtown El Gouna, the Fish Farm has resplendent lush green gardens that will transport both newlyweds and guests to a different time and place. Have a country, farm-style wedding at this unmatched venue in El Gouna where you can breath in the fresh air and take in the rich foliage that surrounds you while the wedding music carries you into a blissful reverie. Whether you choose beach, sea or garden, El Gouna hotels and venues will have a wedding for you that you will last a lifetime.